Julie Duell (nee Henderson) is a 6th generation Australian going back to the First Fleet of English convicts to arrive in Sydney cove in 1788. She also has a drop of American Shoshone Indian heritage for good measure! 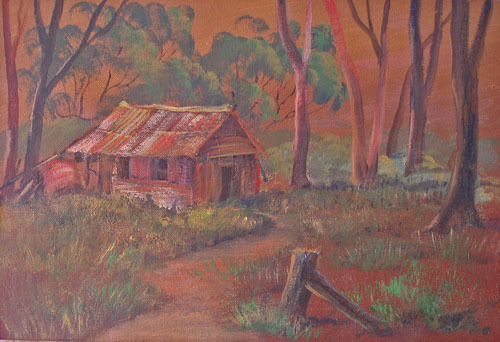 Julie was born in Sydney in 1941 and continued to reside in Sydney environs thereafter. Julie was named after the month of her birth, July. 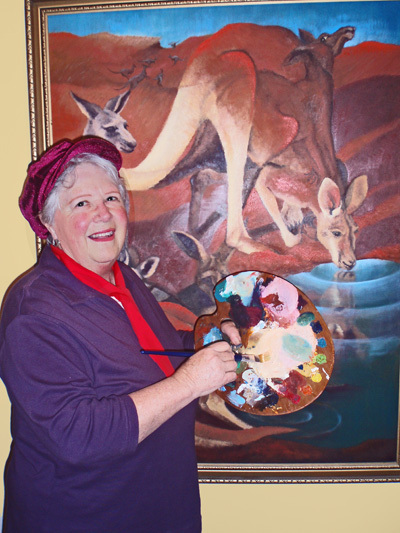 Over many prolific artistic years, Julie has painted under the names Julie Ferguson and J. Ferguson-Duell before simply signing her works Julie Duell. As a child, she studied art at St. George Technical College, Kogarah and singing with a private teacher in Rockdale, entering numerous Eisteddfods as a soloist with some success. 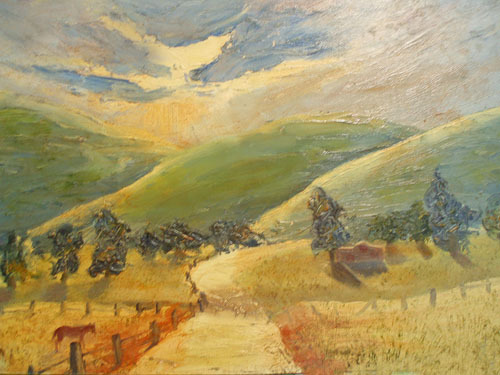 Adult years saw Julie resume her art studies, once again at St. George Technical College and then numerous short courses on the Central Coast where she has been a prolific practising artist and art teacher since around 1970. Inspiration: A deep love of nature, children and a fascination for human form, body language and portraiture. Also, the fairy realm. Mediums of expression: Painting and drawing in charcoal, oils, pastels, inks, watercolour and acrylics with many works executed in mixed media. Her children’s book creations feature Australian fairies in the form of Sprites. Clay modelling and printmaking have been other strings to her bow. Awards: Among a number of awards over the years, Julie’s Children’s book “Bush Sprites of Australia” attracted a special award from the Riso Educational Foundation of Japan in 1985, along with 3rd prize in an International Postcard Competition that year. It has become apparent from online painting lessons being requested that a post covering glazing and also misting effects is needed. 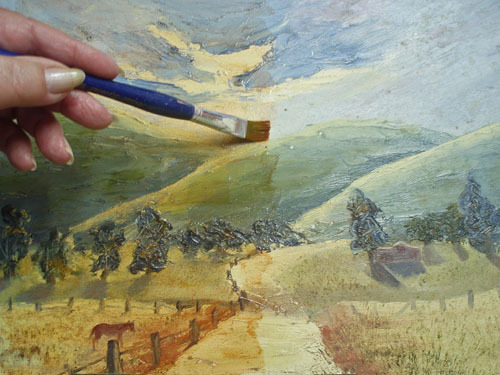 Glazing in this instance is another term for thin washes of transparent paint, mixed either with appropriate solvents or Retouching Varnish (if using oils). Sometimes we might finish a painting only to find it is not quite what we hoped for – colourwise – maybe it is too cold, too dull or the colours don’t relate to one another as a whole. This can often be helped by putting a thin wash over the entire painting (or parts of it if you wish) using transparent paint. 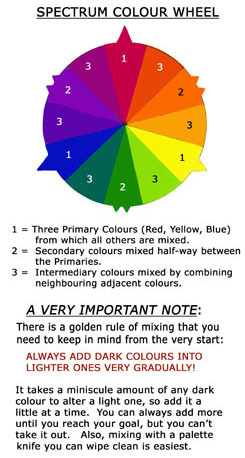 Not only does this unify the painting’ s overall colouring but it can brighten or subdue as needed. 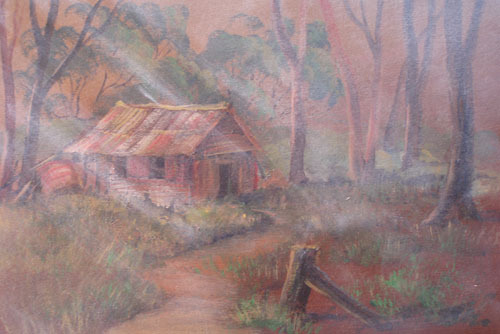 Here is a painting lacking in warmth and needing a little “sunshine” washed into it. The painting is largely blueish so I will glaze using the complementary opposite to blue on the colour wheel, which is orange. I am going to apply a soft orange glaze with a brush first to the left hand side and will use a mixture of Indian Yellow and Crimson Alizarin oil paints, diluted with Retouching Varnish. Can you see how it is bringing this little painting to life? As well as providing a protective finish, Retouching Varnish gives a sheen to the paint, bringing up any flat areas and enriching the darker colours. It is, to my knowledge, the only varnish safe to use on oil paintings prior to 6 months after their completion. This is because it is turpentine based and allows the paint to cure by drying out through it. It is best to apply this varnish with plenty of ventilation to avoid inhaling. Now here is a picture showing the painting before and after glazing. You be the judge. Has glazing improved it? I would love to hear what you think! Misting in this instance is like glazing, except with opaque colour instead of transparent, mixed with a little Retouching Varnish. 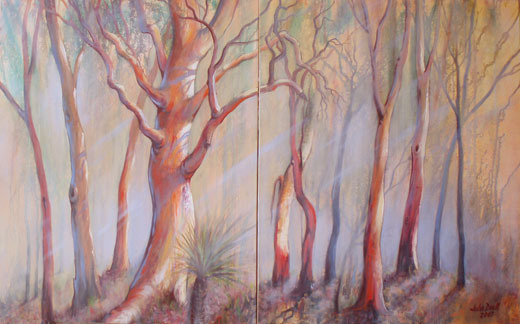 The foliage behind the trunks has been misted softly and rays of light added for drama. How was it done? 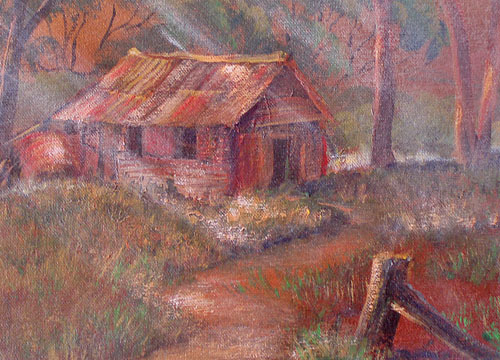 Well here is an example…the oil painting below I had discarded as a failure, being too dark and lacking in atmosphere. I decided to do what I could to save it by “rolling in the mist” and maybe some shafts of light. 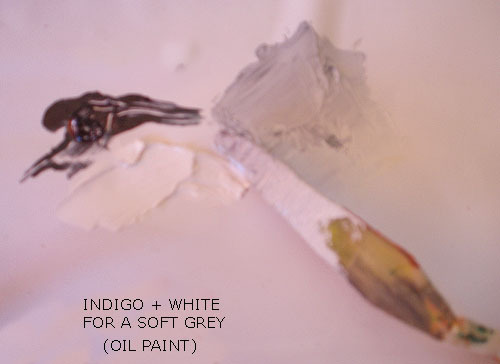 First, I prepared a mix of 2 oil paints – white + indigo (a dark cool grey). I also had handy some Retouching Varnish and a soft rag. 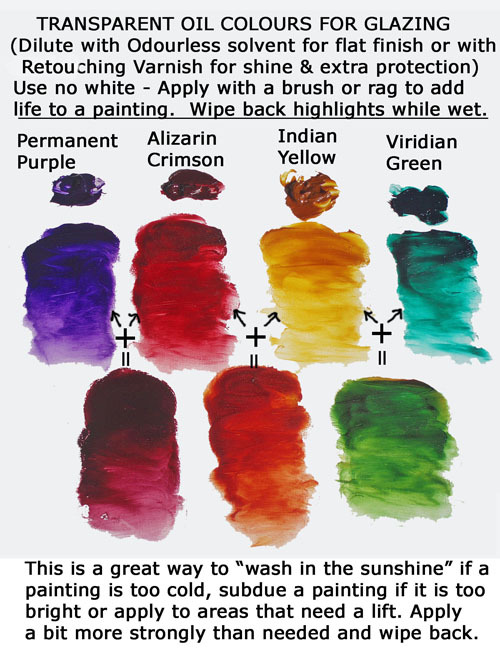 You can apply this method over oils or acrylic so long as they are dry to the touch. There are many different greys you can use – you need to choose whether you want warm or cool grey and just how pale to mix it for your particular painting – I do suggest however that if you mix a grey with just black and white, add a little colour into it so that it doesn’t have a ‘dead’ look. The warmer the grey, the more dusty or sunlit it will look. Cooler greys suggest mist or smoke. Can you see the soft grey at the right, which has been mixed from the 2 at left? That is the grey I will pick up on a rag to apply over the painting. I like to mix with a painting knife for a clean mix and easy wipe clean. I continue over the rest of the painting, heartened by the effect being achieved! I realise that I’ve now overdone it and too much detail has been lost in the mist – so taking a clean dry part of the rag, I rub to remove some of the pale grey – still working at the same angle. 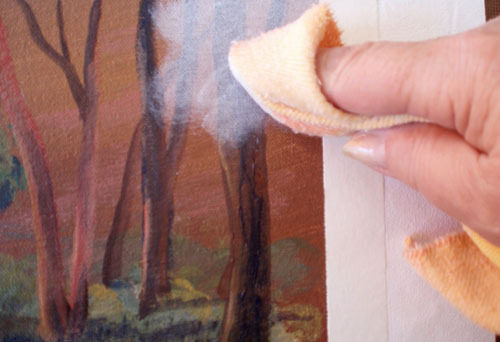 If I need to take more off, I moisten the rag with clear retouch varnish only and rub. I have seen an opportunity to focus on patches of dappled light as a feature in this painting and build up some softly sunlit areas. Sometimes we see this effect with early morning mist or with smoke. 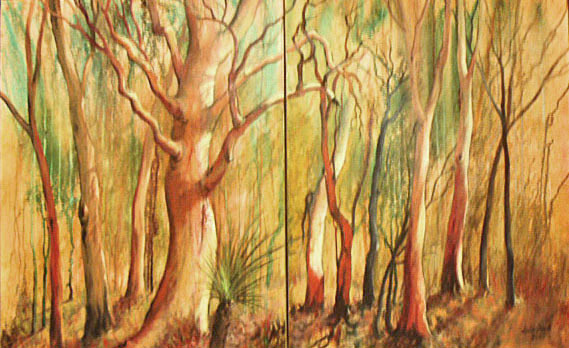 Here is a close up to show the effect, which I have seen all too often in my childhood in my “little home among the gumtrees” (not unlike this one) in the Australian bush. Ok now lets take a look at the before and after pictures and once again – you be the judge! Did misting improve it? 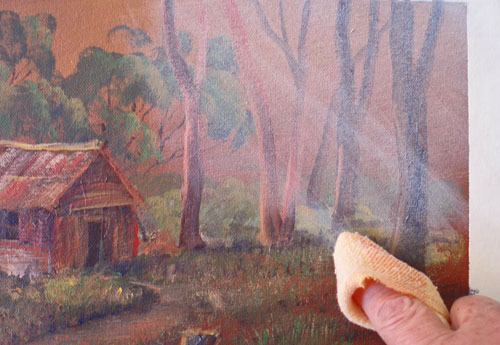 By the way, this is a great way to put in a whisp of smoke from a chimney or campfire in a painting or if you use a warm grey, suggest dust rising – for example around the feet of cattle or horses. I remember one of my classes were thrilled to learn this, as some were painting horses at the time and this meant they could disguise their feet, which they were having a lot of trouble with! Actually, I’ve seen some marvelous innovations by students to deal with this problem: water splashing up, dust rising, snow and long grass! Anything rather than learn how to paint their hooves properly! It has been a great source of amusement to me over the years. I’m sure in my earlier stages of learning I was guilty of it too! Ah – now it can go back up on the wall and I know I will feel more peaceful when my eyes wander over this softened image. Which version do you like best? After all, we are all different – so lets rejoice in our differences as we enjoy our growth and embrace all positive change. How about some overall feedback from you? Do you like these effects? Are they useful to you? 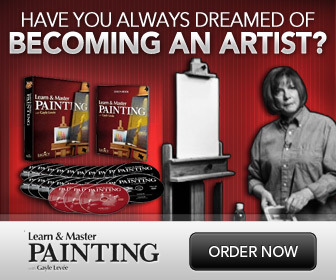 I have found them invaluable over many years, both when using oils and acrylics. 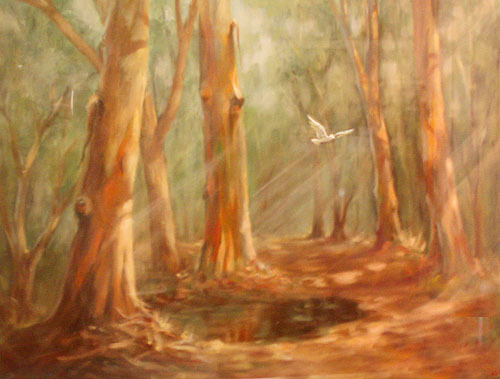 It’s a great way to achieve atmosphere in paintings. All for now and Happy Painting to you all! Don’t forget, feedback and suggestions are very welcome, as this is all in the spirit of free sharing. 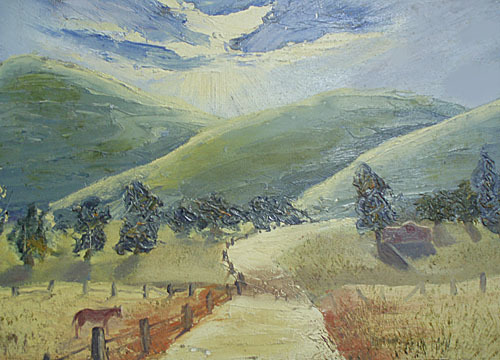 I hope you enjoyed this oil painting glazing tutorial by Artist Julie Duell. i love the misting effect and will have a try on the glazing i feel that the sky was a touch over done,but thank you as I will try this glazing to. Thank you so much for sharing your tips with us. I’m finding them to be quite useful and will be passing along this link to a number of my friends! The last painting you worked on..The trees. Had been hanging a while and was perfectly dry. You then applied a light cream paint to obscure the details…How long before that dried and you were able to go in with the “mist” ? Julie, your misting and glazing tutorial seems like pure magic. I will surely try out that technique.